is large variation in the pressure/temperature conditions, such as in high pressure-high temperature (HPHT) wells, and deep-water drilling, where low temperature conditions are encountered very close to the sea bed. equivalent circulating density due to compression. The increase in temperature on the other hand, causes a decrease in the equivalent circulating density due to thermal expansion. It is most often assumed that these two effects cancel each other out. This is not always the case, especially in high temperature, high pressure wells. of the riser will be 2700 psi, with a mud density of 8.6 lb/gal and a water depth 6000-ft. The low temperature conditions can cause severe gelling of the drilling fluid, especially in oil-base muds (OBM). Failure to take this effect into account will result in underestimation of the equivalent circulating density of the drilling fluid. The focus of this research is to study the effect of pressure and temperature on equivalent static density as well as equivalent circulating density of drilling fluids. and some being compositional. The compositional model characterizes the volumetric behavior of drilling fluids based on the behavior of the individual constituents of the drilling fluid. Hence, prior knowledge of the composition of the drilling fluid is required for application of the compositional model. In the compositional model, the density of any solids content in the drilling fluid is taken to be independent of temperature and pressure. It is assumed that any change in density is due to density changes in the liquid phases. It is also assumed that there are no physical and/or chemical interactions between the solid and liquid phases in the drilling fluid, or that the solid phase is inert. Hoberock et al proposed the following compositional model for equivalent static density of drilling fluids. f vo, fvw, fvs, fvc = fractional volume of oil, water, solid weighting material, and chemical additives, respectively . from knowledge of mud composition, density of constituents at ambient or standard temperature and pressure, and density of liquid constituents at elevated temperature and pressure. Peters et al applied the Hoberock et al compositional model successfully to model volumetric behavior of diesel-based and mineral oil- based drilling fluids. In their study, they measured the density of the individual liquid components of each drilling fluid at temperatures varying from 78-350 F and pressures varying from 0-15,000 psi. Using this data in conjunction with Hoberock et al’s compositional model, they were able to predict the density of the drilling fluids at the elevated temperature-pressure conditions. equation, which was reported to yield very low error in predicting water densities in the HTHP region. Isambourg et al proposed a nine-parameter polynomial model to describe the volumetric behavior of the liquid phases in drilling fluids, which is applicable in the range of 14.5-20,000 psi and 60-400 F. This model characterizes the volumetric behavior of the liquid phases in the drilling fluid with respect to temperature and pressure, and is applied in a similar compositional model to that proposed by Hoberock et al. The model also assumes that all volumetric changes in the drilling fluid is due to the liquid phase, and application of the model requires a very accurate measurement of the reference mud density at surface conditions. Kutasov proposed an empirical equation of state (EOS) model for drilling fluids to express the pressure-density-temperature dependent relationship. As is the case for the compositional model, mud density using Kutasov’s empirical equation of state is evaluated relative to its density at standard conditions (p= 14.7 psi, T = 60 oF). He applied the equation of state with a temperature-depth relationship in order evaluate hydrostatic pressure and equivalent static density as a function of depth. OBM’s formulated using diesel oil No. 2, and 4 OBM’s formulated using mineral oil. Babu9 found that the empirical model yielded more accurate estimates for the pressure-density-temperature behavior of a majority of the muds over the range of measured data more accurately than the compositional model. He also concluded that the empirical model has more practical application because unlike compositional models, it is not hindered by the need to know the contents of the drilling fluid in question. Drilling fluids contain complex mixtures of additives, which can vary widely with the location of the well, and sometimes with different stages in the same well. This was especially apparent in the behavior of the drilling fluids prepared with diesel oil No. 2. Different oils available under the category of diesel oil No. 2 that were used in the preparation of OBM’s can exhibit different compressibility and thermal expansion characteristics, which were reflected in the pressure-density-temperature dependent behavior of the fluids prepared with them. Research has also been reported on characterizing drilling fluid rheology at high temperature/high pressure conditions. Rommetveit et al approached their analysis of shear stress/shear rate data at high temperature and pressure by multiplying shear stress by a factor which depends on pressure, temperature and shear rate. Coefficients of this multiplying factor are fitted to shear stress/shear rate data directly without extracting rheological parameters such as yield stress first. This eliminates the need to characterize the behavior of each rheological parameter relative to pressure and temperature changes. In essence, they obtain an empirical model in which the effects of variation in all rheological parameters that describe fluid flow behavior are lumped together. density and rheological characteristics can change rapidly due to rapid changes in temperature. Research on this effect is still at a very early stage and will not be taken into account during this study. For the Herschel-Bulkley model, it was found that the fluid viscosity at high shear rates increased with pressure to an extent, which increases with the fluid density, and decreases with temperature in a similar manner to pure water. Alderman et al found the yield stress to vary little with pressure- temperature conditions. The yield stress remained essentially constant with respect to temperature until a characteristic threshold temperature is attained. the Casson model will become increasingly inaccurate at these two extremes, that is, at high temperature and low pressure. 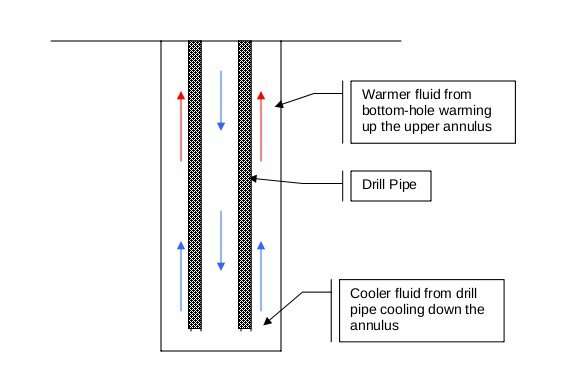 There are two major methods for estimating the down-hole temperature of drilling fluid. The first is the analytical method. This method assumes constant fluid properties. Ramey solved the equations governing heat transfer in a well bore for the case of hot-fluid injection for enhanced oil recovery. His solution permits the estimation of the fluid, tubing and casing temperature as a function of depth. He assumed that heat transfer in the well bore is steady state, while heat transfer in the formation is unsteady radial conduction. 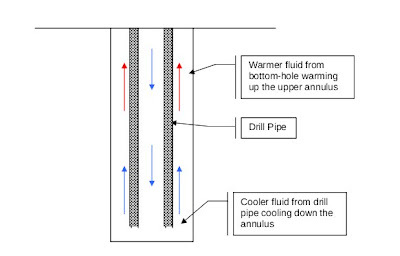 this assumption by asserting that the heat transfer from the formation is negligible in comparison to the heat transfer between the drill pipe and annular sections due to the low thermal conductivity of the formation. formation, and evaluated a number of dimensionless time functions. scheme. Marshal et al created a model to estimate the transient and steady-state temperatures in a well bore during drilling, production and shut-in using a finite difference approach. Romero and Touboul created a numerical simulator for designing and evaluating down-hole circulating temperatures during drilling and cementing operations in deep-water wells. Zhongming and Novotny developed a finite difference model to predict the well bore and formation transient temperature behavior during drilling fluid circulation for wells with multiple temperature gradients and well bore deviations.